. 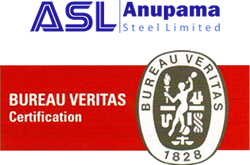 : Anupama Steel Limited :. Steel scrap from the demolished ships is a major source of raw material for the re-rolling mills in our country. Normally at least 70 % of the total light displacement tonnage of a ship broken constitutes of re-rollable scrap. These are converted into bars and rods that are used in the construction sector. The other raw materials to produce bars and rods are re-rollable scrap from railways, pencil ingots from induction furnaces, semis from the integrated plants and imported re-rollable scrap. Scrap from ship breaking fetches a very good price in the market. If prices express consumer preference, then there is a strong preference for the ship-recycling scrap. This is because of the high quality of steel that comes in the form of re-rollable scrap from ships. Ships are manufactured with acute specifications. The manufacture of ships is done usually in the developed countries and the specifications are monitored closely in order to avoid accidents. The general features of steels that are used to manufacture ships are ability to withstand pressure, high impact and strain on account of severe cold. These features if translated into manufacture of bars and rods may give us similar qualities of steel with equal strength. The material processed from ship breaking scrap is better in terms of yield strength, notch impact strength and through thickness ductility. In terms of chemical composition it is consistent and has low sulphur and phosphorus content. In terms of metallurgical properties, steel from ships are normalized, fully killed and has finer and more compact grain structure, free from inclusions, pores and cracks and austenitic properties. » Pursuant to SEBI's circular investors are requested to dematerialize their physical share certificates.